The 100th anniversary of the American Legion is marked by the United States Mint in 2019 with the release of four different coins for those buying silver, which are offered alongside two gold coins. The coins feature images that differ across the silver bullion, silver clad, and gold coins. Today, 2019-P $1 Silver American Legion 100th Anniversary Coins are available to you online at Silver.com. Available to ship inside of capsules, US Mint boxes, and come with a Certificate of Authenticity! Offered to celebrate the 100th Anniversary of the American Legion! Mintage limited to 400,000 coins across the product lineup! Consists of 26.730 Grams, or .8594 Troy ounces, of .999 fine silver in BU condition. On the obverse side of the coin is the image of the American Legion emblem. The reverse side includes the American flag alongside the American Legion flag. “P” mint marks from the Philadelphia Mint. The United States Mint’s collection of gold and silver coins marking the 100th anniversary of the American Legion includes four silver coins and two gold coins. These silver coins are the BU, uncirculated version of the silver dollar coin. It is included along with a proof silver dollar option. The other silver option is a silver-clad, half-dollar coin with its own unique design. The gold coins are available as well in uncirculated and proof options with $5 (USD) face values. All 2019-P $1 Silver American Legion 100th Anniversary Coins in this listing come to you in Brilliant Uncirculated condition. These silver dollars are available to you with protective capsules around the coin and a velvet-lined US Mint display box to house the coin. The coins each come with their own Certificate of Authenticity. 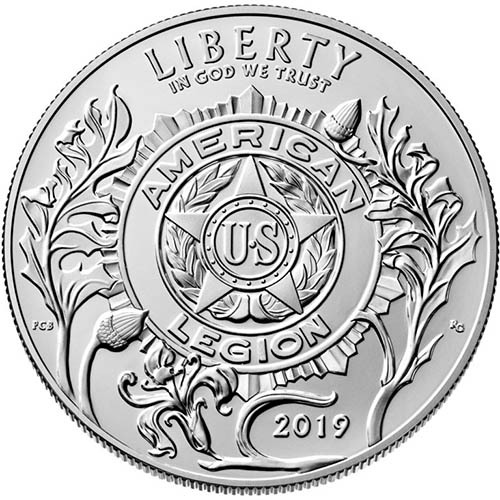 On the obverse side of 2019 Silver American Legion Coins is the design of the American Legion emblem. The emblem has the appearance of a badge with a five-pointed star in the center. The letters “US” are on the center of the star and it is immediately flanked by a wreath around the star. The rim around the star has the words “American Legion.” Around the emblem, there are oak leaves and a lily. 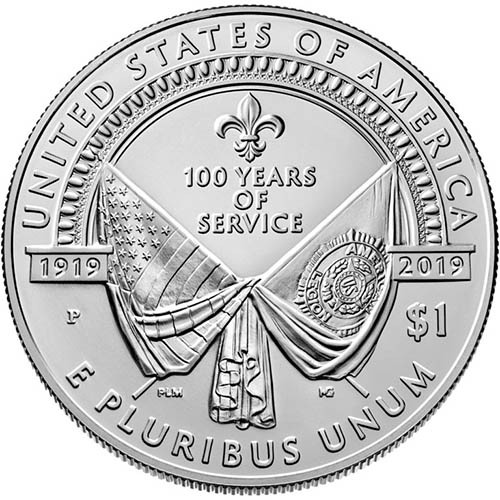 The reverse face of 2019-P $1 Silver American Legion 100th Anniversary Coins includes the design of two crossed flags. One of these flags is the Stars and Stripes, the national flag of the United States of America. The other is the American Legion flag with its emblem featured prominently in the center. There is a fleur de lis above signifying the group’s founding by American Expeditionary Forces stationed in France after World War I.